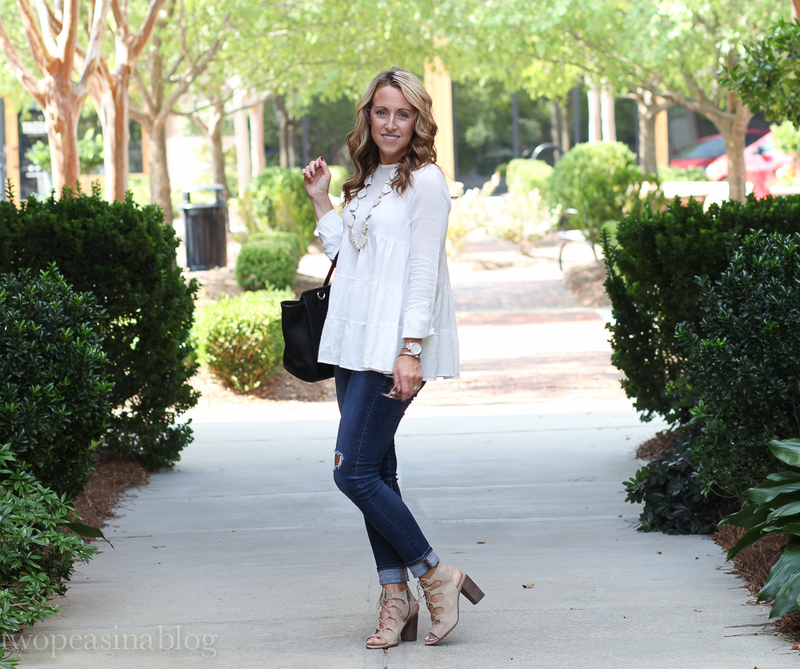 A romantic white blouse paired with white marble for a lightened Fall look. I was so excited when I found this blouse (also comes in this similar style). 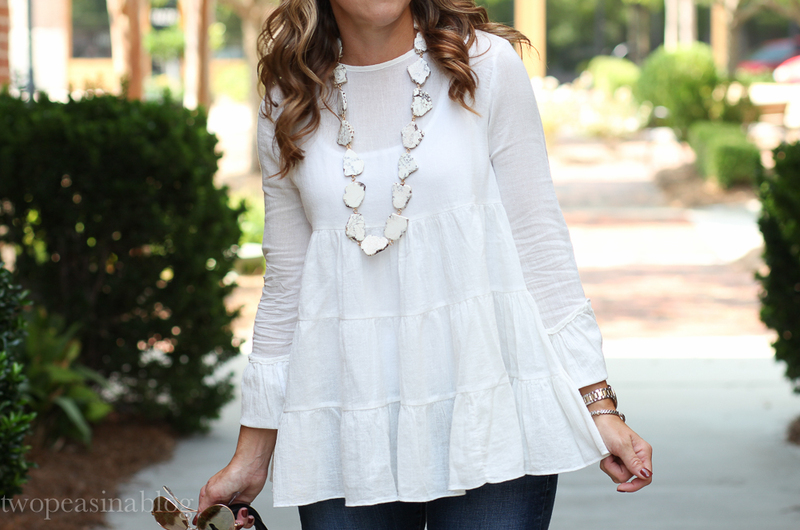 It mixes a tiered peplum hemline with a fun gauzy material! Such a beautiful combo!! I'm wearing an XS for a size reference. I think this sweet little blouse will also be perfect this Fall/Winter layered under a long cardigan sweater, like this one. Did you notice my marble necklace? It's another new favorite. Also available in turquoise. Make sure you check out their site, Purple Peridot, here for some other great jewelry and accessories. 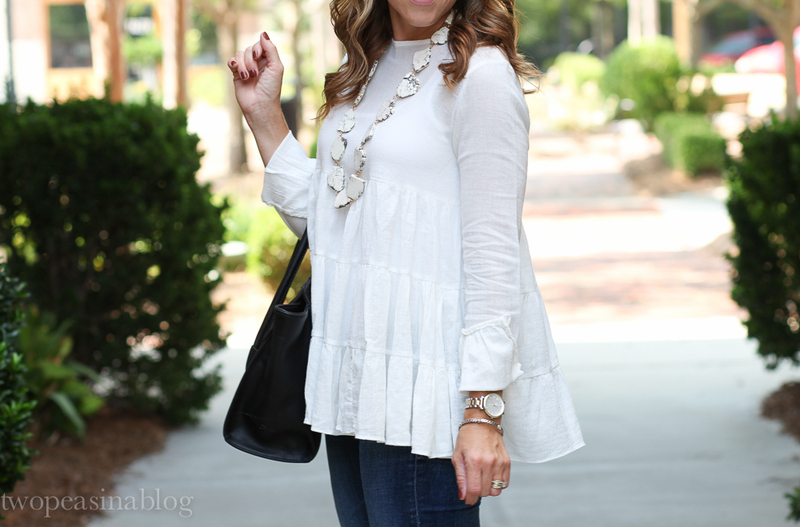 Today's feature blogger is Rema from Jewelry & Jeans. We are in love with this gorgeous dress and how it pairs perfectly with the Fall booties. 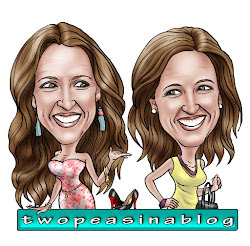 She's a wife, a mother and a super cute blogger, so make sure you check out her blog here!! Now for today's link up. Kashina, thanks. Your comments are so sweet. I'm glad you stopped by and joined the link up. Beautiful top, I can picture it with tasseled necklaces and fall booties, looking lovely. Rachel, yes I think I will be able to wear it all Fall/ Winter too!! Thanks for joining the link up. 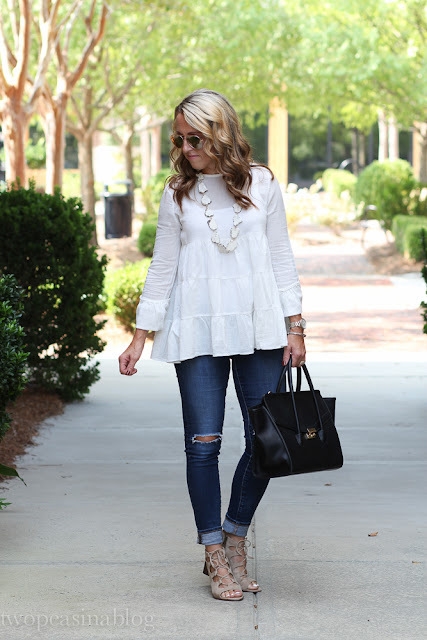 Such a pretty blouse! I can def see it layered for the winter, and I love it with the marble necklace! Thanks sweetie!! The necklace is really so pretty in person. Thanks for stopping by. 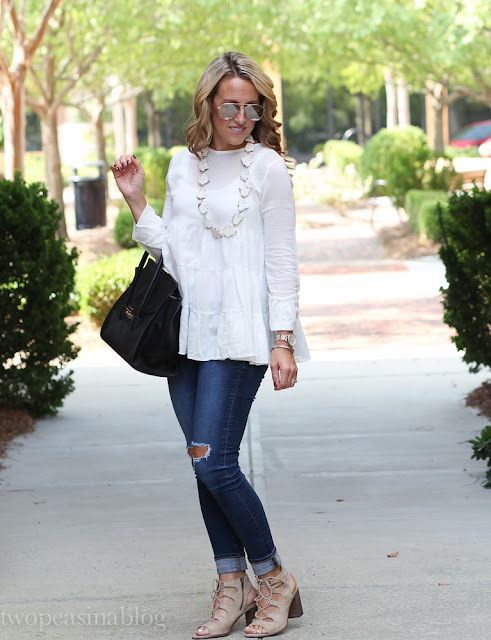 The shape/style of your blouse is so fun and flirty! Kate, yes. I love anything peplum or shaped like this. Flowy and soft are my favorite. Thanks for reading. This is such a cute look! 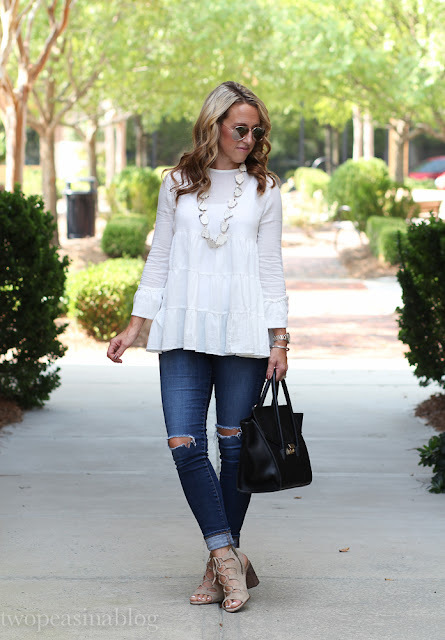 Love that top, booties, and the necklace is amazing! Amy, awww, you're too sweet. The lace up booties are from last year, but they brought them back this year too. I love them and how they go with so many different looks. Long flowy tops are so my jam! This is such a pretty outfit! And it looks so comfortable. I love your booties, too! Shelbee, thanks for stopping by. I probably wear long flowy tops too much, but I just love them!! Glad you stopped by. These sandals are from last year, but were brought back this year. I wear them all the time, they are just so comfy. I must admit that necklace is calling my name---love it! Did you see the turquoise color? It's gorgeous too, but I wasn't sure I'd wear it as much during the Fall/Winter. I think the white marble will go with everything. It is such a romantic and you paired it well. Rose, thanks for stopping by the blog. Your so sweet for your nice colors. You look so great in that top! And the sandals are so cute - perfect to transition into fall! Glad you stopped by the blog. Thanks for your sweet comments!!! What a perfect floaty pieces and love your necklace with it! I like to find those transitional pieces too!. I always enjoy your Tuesday link up!!!! Thanks for stopping by! Great outfit - it will be easy to wear all those pieces into Fall. Yes, I love simple transition pieces. These booties are super comfy. I'm loving your necklace! Neutrals for the win! I love that necklace! I'm sure you could wear it with all sorts of different outfits!